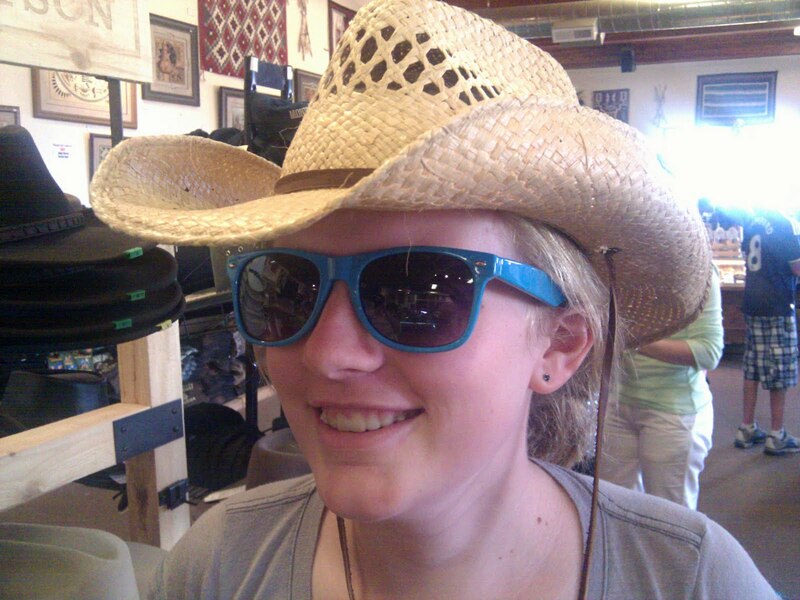 Today we leave Durango and travel west to Utah and Arizona. We take a detour at Cortez, just west of Durango, to visit an Anasazi Indians - the Ancestral Puebloans - heritage site where we learn that it is important to respect these ancient sites that have cutural and spiritual significance for the current Pueblo descendants. This is important to know as we will be visiting such sites and Indian land for the rest of our trip. At Cortez we realize that Phoebe's stuffed animal - Labit - has been left behind in the room of the Hampton Suites in Durango. But, he has been found and the hotel will send him on to Lexington. From here, we start the long drive to Four Corners. This landmark is where Arizona, New Mexico, Colorado and Utah meet at one point. 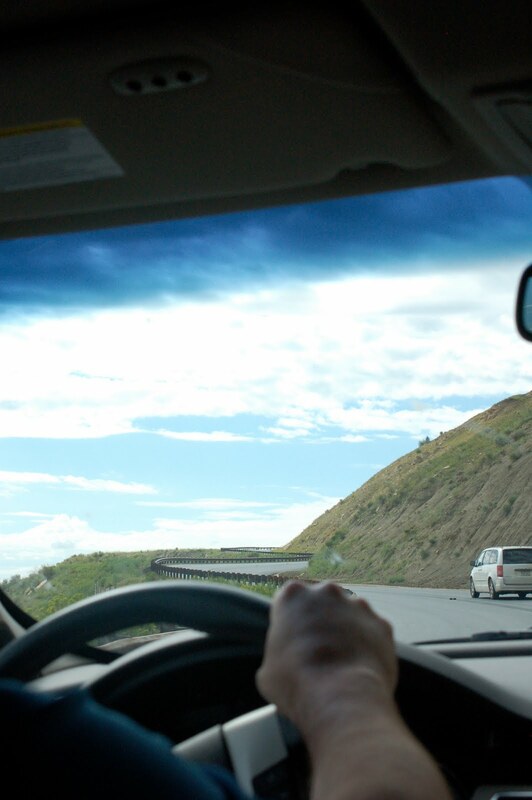 The drive takes us on long straight roads remote from any civilization and devoid of any living creatures. The landscape undulates for miles and miles with rock outcrops and small shrubs that are dotted over the red rocky soil. Although Four Corners is very remote, there are quite a few visitors at the site. We pay our entrance fee. There is a concrete structure and a brass plate on the ground that marks the point where astronomers and geographers have located the exact point where the four states meet. We wait our turn as other people stand on the brass structure and have their photo taken. Some go to the effort of placing each foot and, bending over, each hand in a separate state. Although it is only about 83 degrees, the sun is very hot. It is breezy and this is pleasant unless one stands in the area down wind from the pit toilets. On two sides of the landmark there are low and long open-front buildings. In each there are separate stalls belonging to approximately 30 Navajo traders. Four Corners is on Navajo Indian land. They are selling jewellery, although there are a few other things. We wander along and buy a hand-painted fridge magnet depicting the four corners. George and Max each buy a sling shot with a wolf head carved on the front. Our drive from Four Corners to Monument Valley, Utah now begins. The drive again takes us through remote landscapes that changes from shrub to bare and dramatic outcrops of red rock. Some rock formations rise vertically from the ground. These are volcanic plugs of igneous rock that have withstood the erosion that has shaped the surrounding landscape of sedimentary rock. Eventually in the distance we see buttes.We are approaching Monument Valley and we are seeing the huge red buttes rising from the landscape. The Valley is part of the Navajo Nation where the Dino people live. There is a fee to get into the park. As we wait in line with other cars to pay our fee we see a school bus drop off a teenager. His destination is a group of caravans in the distance down a long dusty red road. Tonight we are booked into The View Hotel. We have booked this hotel months earlier before the rest of our trip was planned. Even then, most of the hotel rooms were booked. The hotel is a low long structure of red stone that blends perfectly with the red rock of the valley. Each hotel room has a balcony that faces the valley for optimum viewing of the landscape. 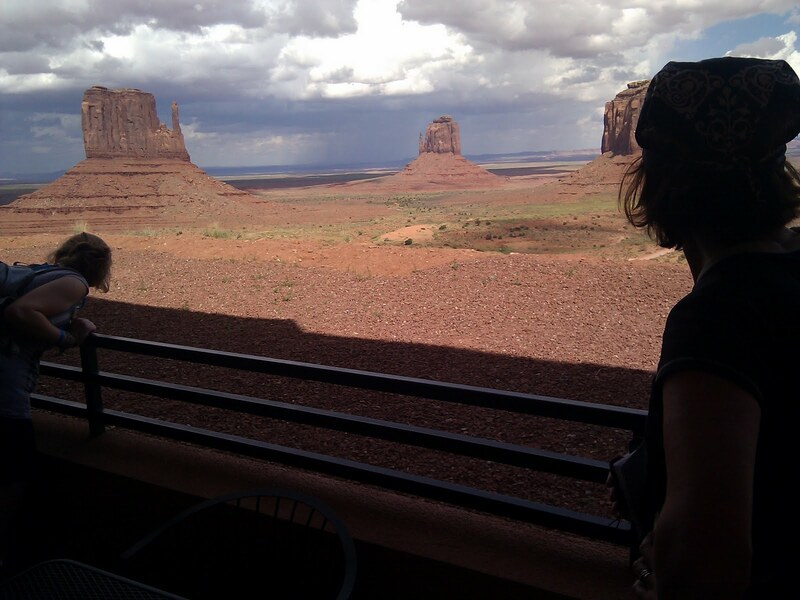 We purchase a piece of Navajo pottery at the trading post within the hotel. Phoebe buys a cowboy hat and we buy another fridge magnet. We like to have one fridge magnet from every state we visit. We cook dinner for Phoebe, George and Max using the microwave in our room. Colin and I go to the restaurant to have dinner and sample the Najavo cuisine that has been highly rated within national magazines across the country. We both choose stews which are extremely tasty and Najavo fried bread which we eat with honey. No alcohol can be purchased on Navajo reservations. Unfortunately the weather forecast for the evening is thunderstorms so we are unlikely to see the spectacular array of stars that can usually be seen when darkness falls. Instead, we watch a spectacular lightening display in the distance. Lightening flashes in four different locations. Some lightening doesn't make it do the ground but instead illuminates the cloud cover. Other sheet lightening touches the ground as strong bright vertical flashes and yet more sheet lightening flashes horizontally across the sky under the clouds. It is awe-inspiring. 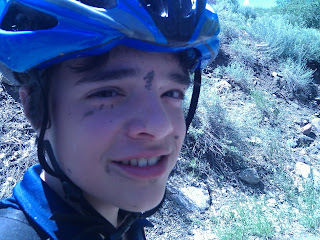 After yesterday's mountain biking we are tired. We don't wake up until 8am. Today we drive north on part of the San Juan Skyway - a scenic 236 mile circular drive from Durango. We have decided not to drive the whole route but to go only as far as Ouray, 75 miles from Durango. The first part of our drive takes us to Silverton. This is the destination of the Durango-Silverton Steam Railway - a 3 hours one way ride at a cost of $400 for our family. As we leave Durango, in our Ford Flex, the road begins to climb and mountain peaks appear in the distance. The road winds and twists with hairpin bends. Silverton is a nice surprise. It is a pretty town with just one main street and only 500 residents. 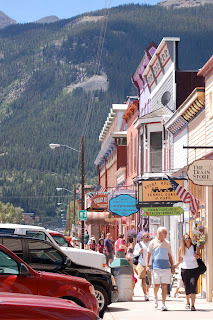 The main street looks like is a set from a Wild West movie. George and I peer into the bank window. The metal grill through which you can see the bank teller looks like it has seen many a Wild West hold-up. We have beaten the train from Durango. It appears a few minutes after we arrive in Silverton. The black steam engine puffs its way into the town on rails on an unmade side street. There is no platform. The train just stops and the passengers disembark. The engine driver climbs onto the top of the engine to clean the large bell. Shopkeepers, from the tourist souvenir shops, come and stand in their doorways. Here come their customers! We wander around the little town for a few minutes. Although the temperature is not very high, the sun is burning hot in the thin mountain air. We soon leave to continue our journey to Ouray. The scenery becomes more spectacular as we leave Silverton. The cliffs and rocks are red and orange. There is evidence of old mines on the mountain sides - past productive iron, copper and silver mining. The left-over piles of mining residue are an environmental problem causing ores to seep into the rainwater as it runs off the land. The stream that occasionally runs by the roadside is bright orange from the iron in the water. The road takes us up on a high pass. On one side of the road there is a cliff face. On the other side of the road there is a sheer drop into the valley below. Colin, as he drives, concentrates on keeping as close as possible to the yellow line in the middle of the road. 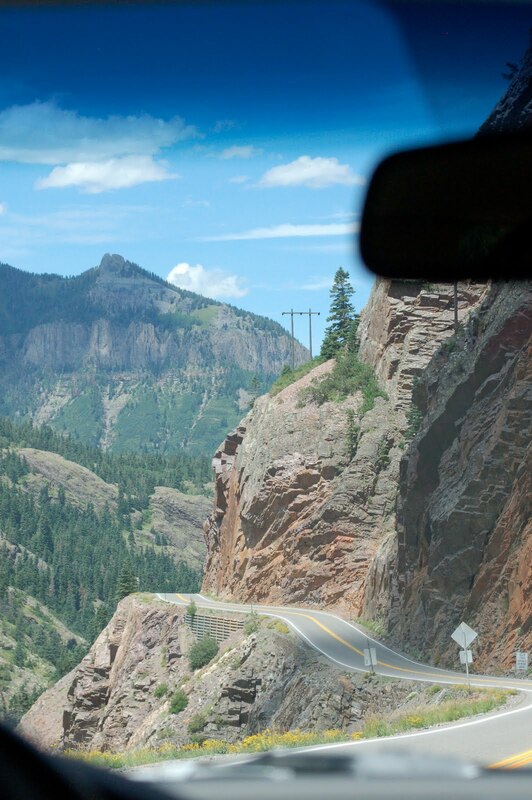 The road descends steeply as Ouray is seen nestled in the bottom of the valley, steep mountain cliffs on each side except for a narrow exit at the end where the road continues through the valley. Ouray, a little Wild West mining town, is even more beautiful than Silverton. We wander through the town and then stop off on a side road for lunch. The road crosses a narrow but very deep canyon through which flows a mountain stream. Although the stream is very small, the canyon shows evidence of a much stronger mountain torrent of snow and ice melt run off. The canyon sides are smooth and arc-shaped from the force of water. As we return to Durango on the same road, the climb out of Ouray over the pass is much more nerve-wracking. This time, instead of being on the side of the road closest to the cliff face, we are on the side of the road with the sheer drop. The road signs post a speed limit of 15 or 20 miles an hour as we weave up the mountain. The road does not look flat. Instead it seems to be tilted slightly towards the drop off the edge of the road. In some places there is a noticeable dip, as if the edge of the road is giving way and crumbling into the canyon below. From our experience of mountain roads, this seems more trecherous than others. There is no guard rail on the edge of the road. Only a thin line of dirt divides the road from the drop into the canyon. Although we meet other cars we are thankful we do not meet the juggernout that we see later on the drive. Even though the road continues to have long drops into the valley below, it is not as severe as the first part of the drive out of Ouray so we are able to relax slightly and enjoy the views of mountain tops, pine trees, waterfalls and mounds of snow caught in ridges higher on the mountains. Back in Durango we walk a few minutes from our hotel to a South Western/Texas barbeque restaurant. The restaurant is very casual. It is more like a wooden shack. We order our food at a bar where it is prepared for us and then take it to tables and wooden benches outside on a veranda. Each table contains a large roll of kitchen paper rather than napkins. The ribs are delicious and messy. We use lots of kitchen paper. Some of the other customers look like they have come directly from Texas. They wear cowboy boots, hats and shiny metal-studded belts. We are, after all, in cowboy country! Blue skies and sunshine but the technician in the bike shop tells us the trails will be hard work from the previous night's rain storm and will cake the tires with red Colorado mud. We are better off waiting until the afternoon when the sun has had a chance to dry the trails. 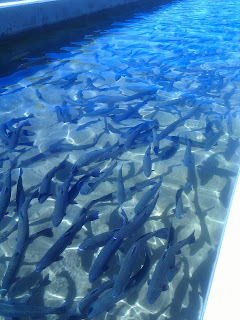 So, instead, we visit the Durango Fish Hatchery. We are the first visitors of the day and the volunteer museum guide is keen to give us all the information about the fish found locally, particularly trout. 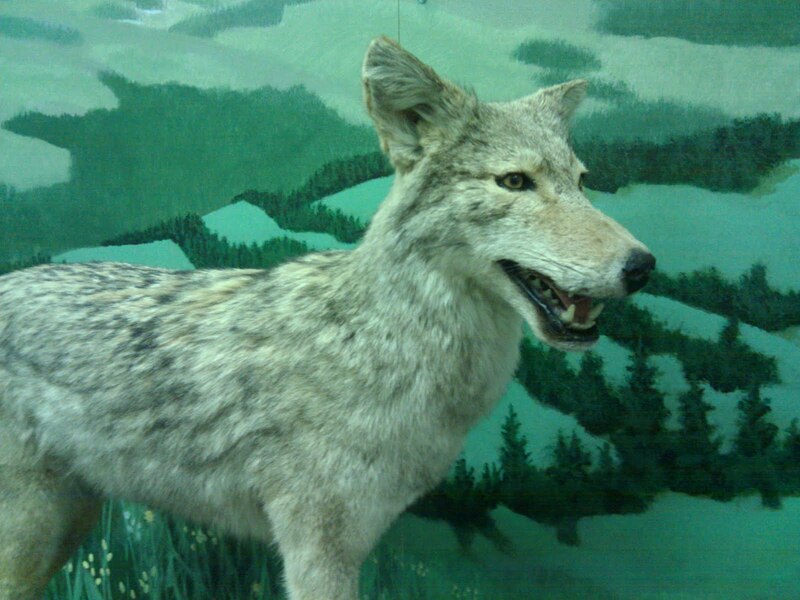 We also view an exhibit of stuffed animals. One is a black bear that was involved in a car accident two years previously. The bear stands over 6 foot high and weighed 400 pounds. Our guide tells stories of a bear that spent a day sitting in the tree outside the museum last summer and a mountain lion that took a dog from the house next door. We wander outside to view the raceways that contain thousands of trout ranging from very small to quite large. From these raceways a million trout are put into the rivers and reservoirs of Colorado each year. After an early packed lunch, eaten from the back of the car, we go to pick up our mountain bikes and set off for an afternoon's riding from the shop. 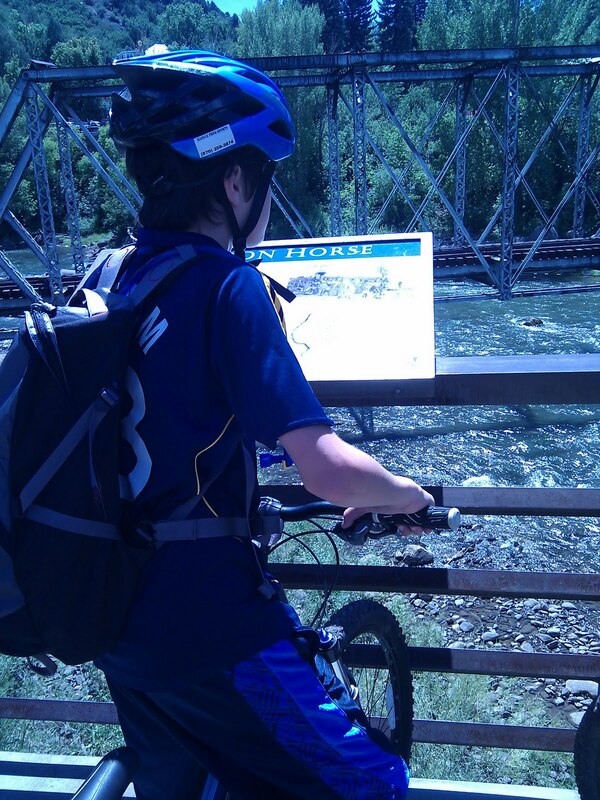 We use a paved biking path to get to and cross the Animas River. Immediately after crossing the river we leave the paved path to take a trail up the hillside. Phoebe falls off her bike as we leave the path. She is not hurt. 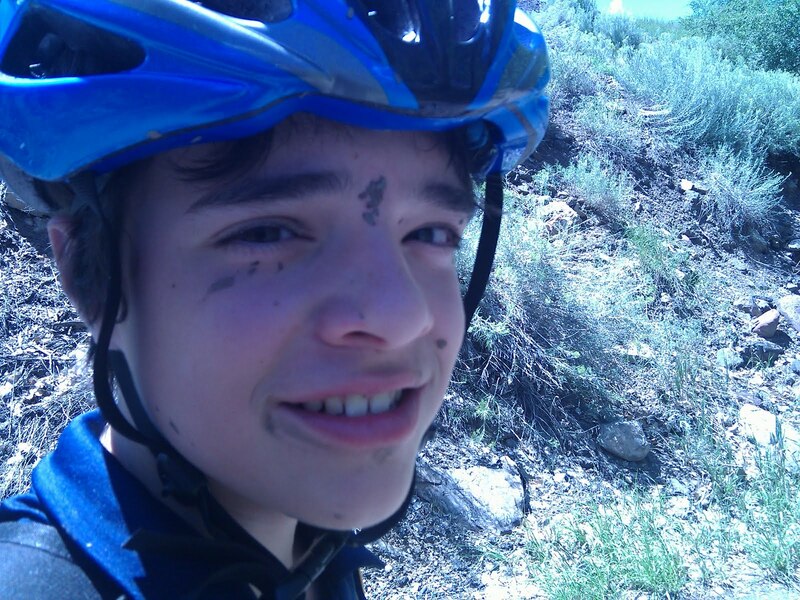 The trail is muddy, rocky, steep and narrow. The undergrowth scratches our legs and arms. Max, George and Colin seem to have no problem making the ascent. Phoebe and Rachel find it very difficult. They walk most of the way up the trail. By now it is hot and the sun is strong. The altitude makes the climb strenuous. Eventually we come to a road. We decide that paved surfaces are perhaps better for a while and return to the river path. Towards the centre of Durango we try another mountain biking area, this time the trail is a wide but rocky unpaved road. Rachel and Phoebe decide to proceed at their own pace, which turns out to only be a few metres. Colin, George and Max ride off making the slow ascent on the road called Horse Gulch. 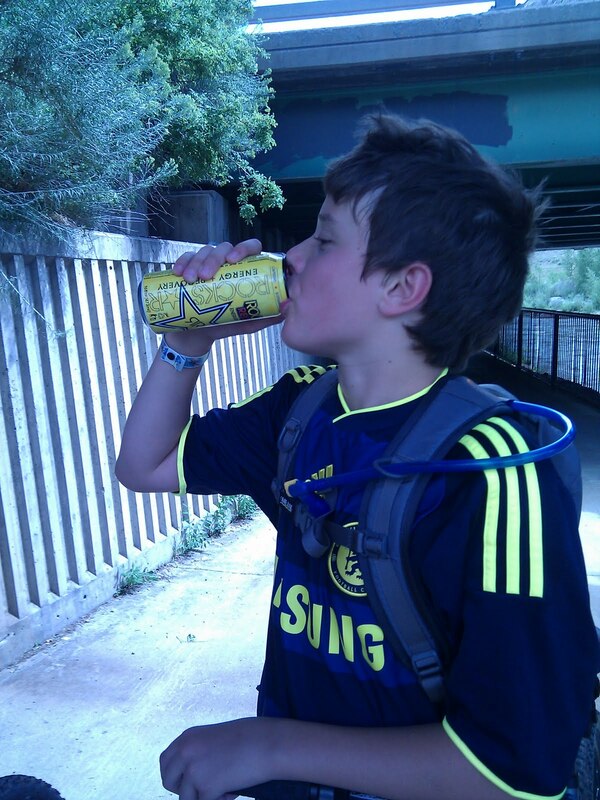 It seems popular with locals who obviously do not have any problem with the altitude or rocky surfaces. When Colin and the boys return we decide to continue our biking by taking different routes, aiming to meet at a point where trail and paved river path join. Colin and Max take the trail while Rachel, Phoebe and George take the paved path. We never meet. Somehow we pass each other at the water treatment works, cycling on different sides of the works. Rachel, Phoebe and George wait for nearly an hour at the designated meeting point. None of them have cell phones. Colin is the only one carrying his phone. Eventually Rachel decides to ask people she meets if she can use their cell phone to call Colin. She imagines an accident has delayed him and Max. The first four people do not have phones. They are returning from a rafting trip on the river. Eventually a woman walking a dog has a phone. The dog is wearing a coat from the animal humane society that says "adopt me". George and Phoebe make a fuss of the dog while Rachel discovers that Colin and Max have been searching for them! They have been cycling to and fro on the path trying to find the other half of their family! A soak in the hotel hot tub helps aching knees and legs. 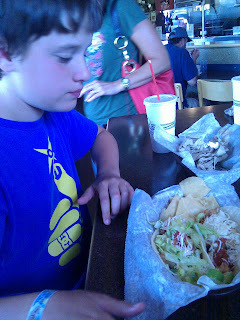 Tonight we discover a Mexican Taquaria - a fast food Mexican restaurant. We join the queue of people. The food is freshly cooked as we wait in line. It is fabulous - and reasonable. Phoebe makes the best choice - fish tacos - battered fish freshly cooked served in small flour tortillas with chopped tomato and Mexican tartar sauce. We all sample it - delicious. We wake to hear rain on the tin roof of our cabin. It has stopped by the time we get up. Phoebe, George and Max's shoes are very muddy as they go for one last visit to see the sheep, goats and llama. We pack the car and leave Bayfield for Durango. As the weather forecast is cloud, rain and thunderstorms we decide to change our plans for the day. Instead of mountain biking we will visit Mesa Verde National Park, just west of Durango. Mesa Verde contains the remains of homes and cliff dwellings of the Ancient Puebloans. In the distance we can see the Mesa of Mesa Verde, a stark cliff face like a jutting chin. After driving along a fairly flat valley, we entered Mesa Verde National Park and began a 12 mile winding ascent to the top of the Mesa. The views as the road climbs are fantastic. We can see far into the distance. It's like the view from an airplane window. Our first stop is the visitor's centre to buy tickets. It is windy and quite cool at the visitor's centre. The wind whips up the valley to the Mesa top where we are waiting in line to buy tickets. Tickets are required for viewing the cliff dwellings with a park ranger as a guide. We choose to visit Long House. This is the most remote cliff dwelling. The tour begins at mid-day. As it was already 11:15 we hurry as we have a 40 minute drive across the Mesa top to our destination. Our group is small, around 20 people instead of the normal 50 people. The cliff dwellings are beneath the Mesa top, over the cliff edge, built in a natural ampitheatre in the sandstone. Although our walk down the cliff is on a paved path with steps to the cliff dwellings, the ancient cliff dwellers scrambled up and down the cliff using toe and hand holds. The drop to the valley bottom is long, down sheer cliffs. It is frightening to think how these people made such a climb. Built in 1200AD, the remains of the houses in the cliffs that we walk around were the choice of around 100 people. Women, men and children lived in this strange ampitheatre instead of living on the Mesa top. Our ranger points out that during this time, in contrast to the primitive lifestyle we see, Notre Dame was being built in Europe. After our tour, we decide to explore other dwellings on the Mesa top before heading back to the car. A tram car takes us and a few other people back to the car park. On the way we see wild horses, but no mountain lions that also live in this area. By now it is mid afternoon. The weather has improved and it is hot and sunny. We drive to the other more popular cliff dwelling but by now we are tired and decide to cut short our visit, only visiting the museum. It is hot and busy and driving on the winding roads is nauseous. Driving back to Durango we see black clouds. Lightening flashes ahead of us and as we draw nearer to Durango, and the hills surrounding the town, we see a thin covering of snow that has just fallen during the storm. We run into our hotel just as it begins to pour with rain. Suddenly the windows are rattling as rain turns to hail. As we go to find a restaurant for dinner, piles of hail stones litter the pavements. Tourists and locals in flip flops and shorts slap their way along the street. George is up early this morning at 6am. There is no television to watch! Instead, he dresses and goes to visit the sheep, goats and llama. Max and Phoebe followed a little while later. Consequently, our usual early morning start is not so early. 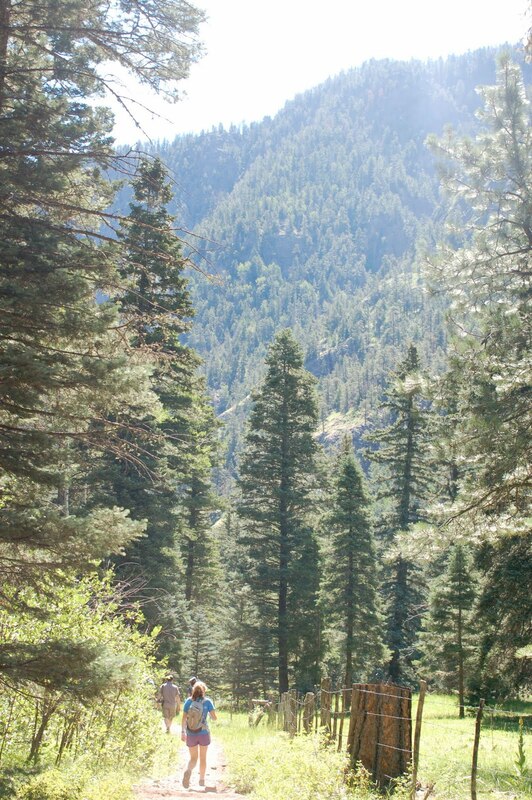 Our aim for the day is to hike near Vallecito Lake. The owners of the farm where we are staying are able to direct us to one of their favourite hikes. We drive to trailhead and are surprised to see the car park full with cars and horse boxes. We speculate that many have probably chosen to stay overnight, as it is the weekend, in the Weminuche Wilderness that can be accessed from this trail. The sun is strong in the thin mountain air. The trail begins in a valley, but we have already climbed in elevation on our drive to the trailhead. The bottom of the valley is flat with a broad meadow dotted with pine trees, owned and fenced in by Granite Peaks Ranch. The sides of the valley rise steeply as granite cliffs, standing majestic against the deep blue sky. We cover exposed skin with sun cream, fill camelbaks with water, pack our picnic lunch and begin our hike. The beginning of the hike takes us through a gate displaying the Ranch name and a notice warning that leaving this area with horses or cattle that do not belong to you is theft. The start of the trail is littered with fresh horse manure. We are thankful for the trees which give shade from the sun. Our progress is slow. This is an "in/out" trail and we are not sure how far we will hike. The trail can take us to Emerald lake high above the valley but this is 10 miles and the last four 4 miles are a steep climb. Having hiked at this altitude before we know that just to get to the lake will take us around 4 hours. After about two miles of walking we come to a creek that flows across the trail. Although it is easy to cross, using rocks that are above the water as stepping stones, we stop for a few minutes to enjoy the stream. Phoebe chooses to take off her hiking boots and dip her feet in the cold water. The trail is strewn with rocks and the elevation rises and falls. George is only wearing indoor soccer shoes. He will borrow Colin's spare trail shoes for future hikes. After about 3 miles and two hours of hiking we enter the Weminuche Wilderness. Even though we have entered the wilderness, the scenery does not change. We encounter a few other people, some walking with their sleeping mats rolled up in their backpacks and some on horses dressed in stetsons and cowboy boots. They carry their packs on a second horse tethered to the first and without a rider. We meet one couple with two llamas who are heading out into the wilderness. The llamas eye us cautiously but are happy to be stroked by George and Max. The llama hair looks so thick it seems impossible that the animals would feel anything. Phoebe looks delighted to see her favourite animal. A little way into the wilderness we decide to stop and find a place near the river for lunch before we head back. The scenery is beautiful with the refreshing sound of running water and sunlight streaming across the pine covered mountain slopes. Lunch is sliced bread filled with sweating cheese slices and ham from our backpacks. Phoebe and George and Max are able to climb onto rocks in the swlrling water of the river and eat lunch on their little islands. Colin and I sit on the remaining rocks closer to the shore. From this point on the 3 miles hike back is at a good speed. It is around 1:30pm and the sun is high in the sky. The trail looks completely different in this light and the heat is getting unbearable. We arrive back glad to consume water and Gatorade that we have in the car.